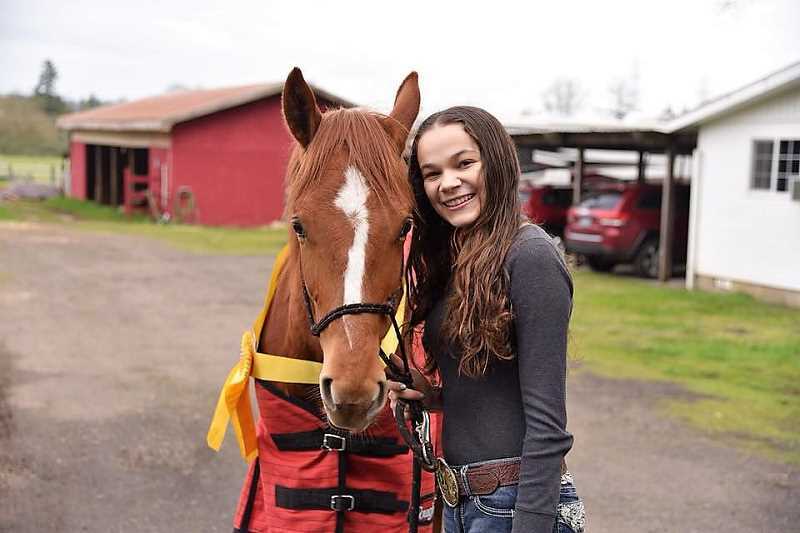 Sherwood High School student Natalie Driscoll trained a wild mustang in 100 days. Natalie Driscoll, 15, speaks about her horse Molokai the way a teenager might talk about a good friend or a coworker. "He's really smart, and he's sassy and dramatic," said Driscoll, a sophomore at Sherwood High School. "He likes having a job, so it's really cool working with him." Molokai isn't just any horse — he's a previously wild mustang who Driscoll was tasked with training in a 100-day period earlier this year. She trained Molokai as part of Teens and Oregon Mustangs, a program started in 2009 by the Mustang Heritage Foundation. With more than five years of experience racing horses competitively, Driscoll knew about Teens and Oregon Mustangs because one of the horses she races had gone through the program. She said she enjoys the sport because of the connection she feels with horses. "It's different than team sports because you're by yourself," she said. "But you're also with another animal, so it's like a two-person thing. It's cool." On Driscoll's first day of training Molokai, the wild mustang was skittish, unwilling to even let her touch him. But by the end of that first day, "he started letting me touch him." "It's cool to see how much they can change in just one day," Driscoll added. "And over 100 days, it's crazy to see how much they can learn." The 100-day training period culminated in a competition, so Driscoll focused on teaching Molokai skills like showmanship, handwork and trail obstacles. Each day, her bond with the horse grew stronger. "I've never had my own horse — I've always used other people's," she said. "So it's been really fun to train him from the beginning, and see how much progress was made between him and I working together, without anyone else training him." As Molokai learned more, he could tend to get overwhelmed. Driscoll had to learn when to push him, and when to let him take a break. Competition day was in March, and Driscoll and Molokai faced off against eight other teams. They took the top spot in the trail and body conditioning categories, and third place in showmanship. That added up to third place in the overall competition. Driscoll may have completed her Teens and Oregon Mustangs round, but she's far from done with equestrian world. She wants to study to be a large animal veterinarian in college — and to continue training wild horses like Molokai.